Home > Blog > What Are Warped Windows and How Can You Fix Them? What Are Warped Windows and How Can You Fix Them? Unless you live in the funhouse and wear makeup and a clown suit to work, you probably want the facade of your home to look…normal. You know…adhering to basic, expected shapes, like a triangular roof and rectangular windows and doors. On the contrary, warped windows can make the outer appearance of your home look just plain wonky. How do Windows Get So Bent Out of Shape? Warping commonly occurs in windows with a wooden frame. It’s a problem that can not only ruin the curb appeal of your home, but destroy its energy efficiency as well, letting out heat when you want to keep it in, and letting it in when you want to keep it out. The main reason windows begin to warp is due to the moisture that’s unevenly absorbed into the grain of the wood. The extra stress induced by this uneven absorption can cause the frame to shrink and expand. Over time, it just gets bent out of shape. Of course, wood naturally retains moisture, which can also cause the frame to swell and buckle, just because it rained, or snowed, or drizzled, or got foggy in the morning. There are other factors that come into play regarding warped windows, like the grain of the wood, finishing and veneer, wind direction, orientation, and climate (that is, temperature and humidity). But even given the most “ideal” and temperate conditions, if wood windows get exposed to moisture, they will warp. Bowing along the face of the window. Crooking along the edge of the window. Kinking along one area of the sash (the frame). Twisting—the edges of the window twist. All of these effects can create some nasty gaps which aren’t only unattractive but can also severely reduce the energy efficiency of your home. If you live in a climate with four seasons, the changes in moisture and humidity can have a seriously adverse impact on your windows when it comes to warping. You may not think that warped windows are such a problem. After all, don’t you think that houses just settle over time? Wouldn’t warped windows just add some character to the facade of your home? Warped windows don’t add the character like other elements that homes pick up over time, like the sun-bleached stucco of a Mediterranean villa or overgrown vines climbing up a brick wall. In fact, warped windows just look bad, because rectangular windows are supposed to look rectangular. And as we mentioned earlier (it bears repeating) warped windows severely reduce the energy efficiency of your home, which is a real problem if you live in a place with seasonal changes. Your home will be colder in the winter, hotter in the summer, and electric (or gas) bills will be higher all year round. Also, when windows get warped out of shape, they can be hard to open or close. That lack of functionality isn’t just aesthetically unappealing: it can also be dangerous if you’re ever in a situation where a window could be a convenient means of escape, like in a fire. 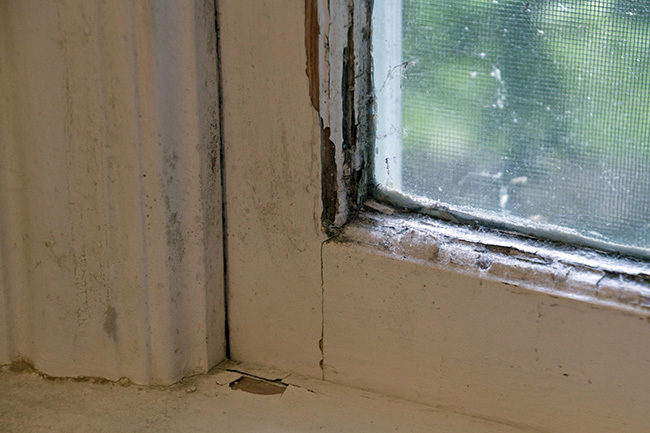 Another problem with warped windows is that a twisted frame, full of gaps, can allow pests like termites to enter your home, and mold to take root in the wood. Truth be told, vinyl windows are durable and strong, so they won’t get bent out of shape, especially when it comes to water-induced warping because vinyl is resistant to moisture. 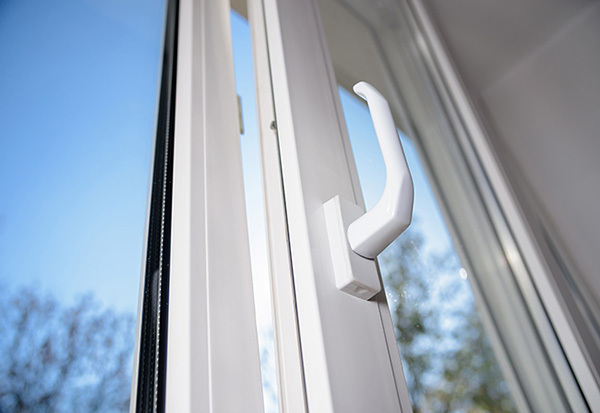 You’ll appreciate the long-lasting material used in vinyl windows and the safety components that will not endanger you, your family and your friends. You won’t need to worry about replacing your vinyl windows for a long time because records verify that vinyl is long-lasting and durable. When it comes to dealing with warped windows, you basically have two options: fix or replace them. As far as fixing them goes, there are some band-aid measures you can take, but they won’t offer a permanent fix. For example, you can loosen the hinges, add some weatherstripping, or fill in the gaps with sealant or caulk, but that’s only going to take you so far. Again, the main problem is that the frame is twisted out of shape. Environmental factors have combined with the material makeup of the frame at the molecular level. That sounds pretty seriously impossible to undo unless you come from the future. There’s not much you can do to unwrap the wood that’s been buckled and jived out of shape by months or years (perhaps decades) of environmentally induced stress. The best solution really is to just replace the windows. Now, you could try to replace the windows yourself, but unless you’re a master carpenter, we suggest you avoid that complex process, because if one little thing is off, it’s going to mess up the whole end result. Most likely, you’ll have to take the whole window out: pane, sash, frame, and all, not to mention insulating the wall space around the window. That said, your best bet is to get someone who specializes in this type of task to do it for you. You will have some options when it comes to the new unit you’re putting in. When you shop around for replacement windows or a company to do the work if your original frames were wood, you might be tempted to go with a wood frame again, but chances are that will not only be hard it find, it will also be expensive. When you replace them, it’s probably best to go with a synthetic option, like vinyl. Unlike wood, vinyl is resistant to moisture and adverse effects from the surrounding climate, so it will be less likely to expand, contract, bend, and warp as much as wood. That wood pulled off a few funky dance moves after a few too many drinks of rain, snow, and dew. Now, if your original windows were vinyl, you may be hesitant to replace them with a frame of similar material, but consider the fact that all things age over time, even synthetic materials. You may also have the opportunity to buy a better quality vinyl frame that won’t be as susceptible to warping and buckling. In fact, vinyl windows offer many benefits. They come in lots of different design options because vinyl is easily molded into a variety of shapes. Colors and finishes can be customized to suit your aesthetic sensibilities and match the facade of your home. They don’t require much maintenance, unlike wood windows. They won’t need to be sanded or repainted, and they can be easily cleaned with soap and water. Vinyl windows are also energy-efficient thermal insulators, especially when compared to other materials like aluminum or wood. Vinyl windows are also recyclable if you have any thoughts or cares about the environmental impact of home repairs. Once removed, they can be melted down like any other thermoplastic and remade into a new product. You’ll feel a lot better about your home curb appeal once you replace your ugly warped windows. You’ll also appreciate better energy efficiency once you switch to vinyl windows. Feldco has outstanding vinyl windows that are dynamic and energy efficient. Replacement windows are custom-made to the exact specifications of your window openings so you can start saving money on your heating and cooling bills from day one. Speak to a product specialist and get a free quote today.